Hanoi (VNA) – Rice exports are expected to recover in the second quarter of this year, boosted by encouraging market signs. 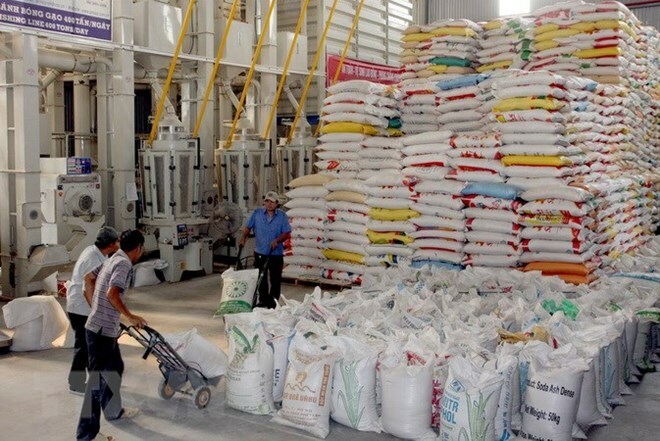 According to the Vietnam Food Association (VFA), Vietnamese rice shipments have stayed in good shape from the beginning of March thanks to the robust demand from Iraq, Malaysia, Cuba and China. Iraq has already signed a deal to purchase 120,000 tonnes of the grain from Vietnam. Exporters expect to ship some 300,000 tonnes to the Southwest Asian country in 2019, equal to the same amount from the previous year. Meanwhile, Malaysia’s commodities procurement agency Bernas sealed an agreement with the Vietnam Northern Food Corporation (Vinafood 1) to buy 25,000 tonnes of 5 percent broken rice. Bernas has requested express delivery for the order to ensure sufficient rice supply in the country. Negotiations are underway with importers from the Philippines and China. Vietnam is gaining competitive edge over its rivals as the price of 5 percent broken rice in March stands at 340 USD per tonne, much lower than the same kind from India, Pakistan and Thailand which are sold at 370 USD, 360 USD, and 388 USD per tonne, respectively. In addition, the VFA is hoping for a rice export deal with the Republic of Korea via the Tariff Rate Quotas (TRQs) system. Last year, Vietnam supplied more than 113,000 tonnes for the East Asian market through the TRQs. Along with such key markets, Vietnam is seeking to get new rice buyers, with Saudi Arabia deemed as a potential market, especially as harsh weather conditions hamper its rice production, driving the country to rely on rice imports. Last year, the country’s consumption of the grain was estimated at 1.27 million tonnes. India is the largest rice provider for Saudi Arabia, accounting for 79 percent of the market share, followed by the US (6 percent), Pakistan (6 percent), Thailand (5 percent), and Vietnam (2 percent).